Marie - Claire - Table service - Baroque style . Marie - Claire - This elegant porcelain collection with white ornament / tendrils / flowers is kept in typical baroque style and consists of many elements in different sizes. Its filigree and decorative silhouette - from a coffee pot to the smallest cups and plates or bowls gives the table covered with it a touch of sophisticated elegance. This porcelain collection is only made to order with about 8 weeks waiting time and it is partly manual work (handle and foot of the cup are manually attached). The glaze, if necessary, gold / platinum decoration is also applied manually. In addition, there are many variants / sizes of serving plates, cake plates, bowl, extra cups and accessories - candlesticks, flower vase, fruit vase, soup vase large, egg cups, salt and pepper cans, butter dish, terrines, milk jug, sugar bowl, etc. 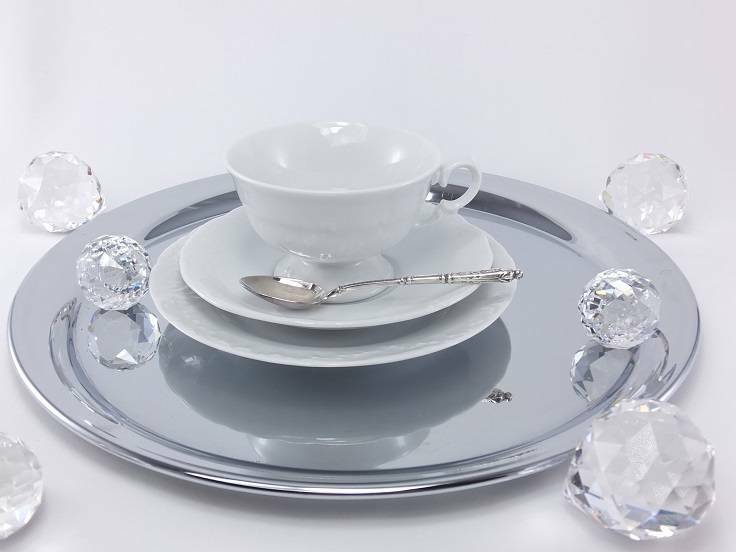 to present you the complete spectrum of the elegant porcelain collection.